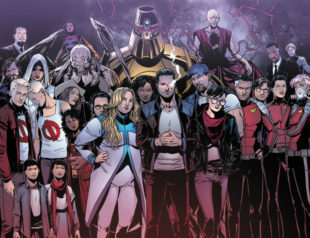 As revealed during the #ValiantSummit 2017event live from Twitch TV’s Hyper RPG studios in Los Angeles, Valiant Entertainment is proud to reveal that New York Times best-selling writer Matt Kindt (X-O MANOWAR, DIVINITY) and superstar artist Doug Braithwaite (X-O MANOWAR, ARMOR HUNTERS) will join forces for HARBINGER WARS 2 #0 – the opening salvo to Valiant’s game-changing crossover event of 2018! This December, join Kindt and Braithwaite as they lay the foundation for the biggest conflict the Valiant Universe has ever witnessed…and prepare its bravest heroes for the untold devastation that awaits! Available only to readers who redeem all four mail-away coupons included inside HARBINGER RENEGADE #1-4, HARBINGER WARS 2 #0 is a standalone prelude that will reveal a secret chapter told in advance of 2018’s seismic event! 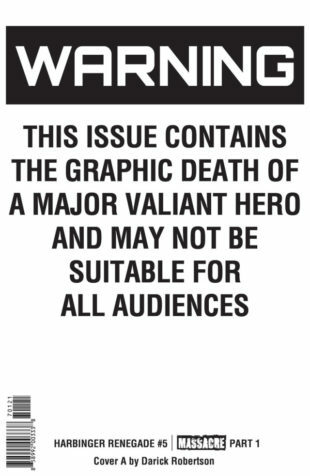 Produced as a special reward for Valiant’s most faithful longtime readers, the events of HARBINGER WARS 2 #0 will be self-contained and will enhance, but not directly impact comprehension, of the primary storyline in 2018. 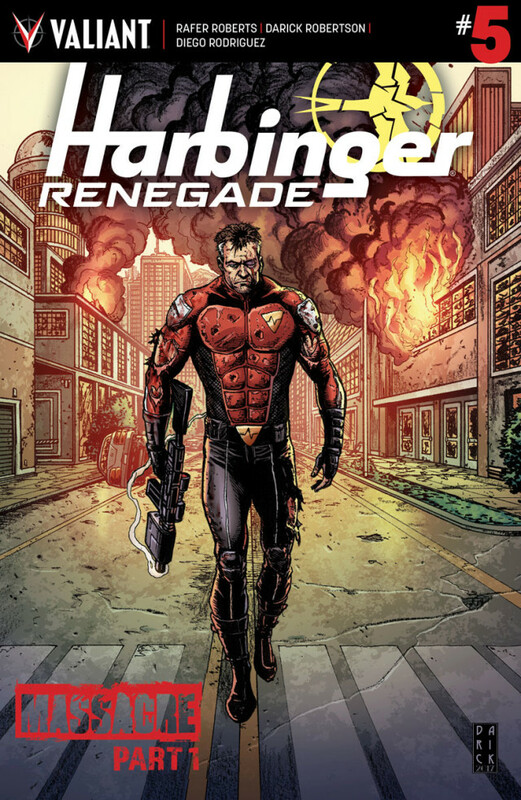 Witness the cataclysmic events that set the impending conflict into motion with “MASSACRE” – a new, four-part jumping-on point beginning July 12th in HARBINGER RENEGADE #5! 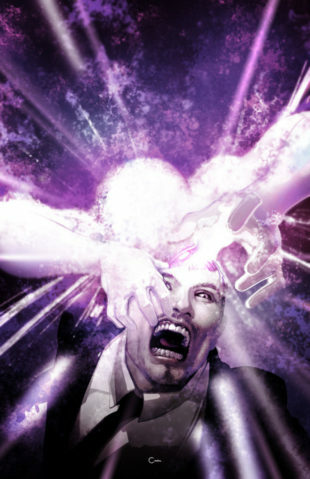 THE ROAD TO HARBINGER WARS 2 starts here in a hailstorm of bloodshed and brutality as multiple Harvey Award nominee Rafer Roberts (Plastic Farm) and superstar artist Darick Robertson (The Boys, Transmetropolitan) present the harrowing, must-read Valiant story of the year…and claim the life of a major Valiant hero! 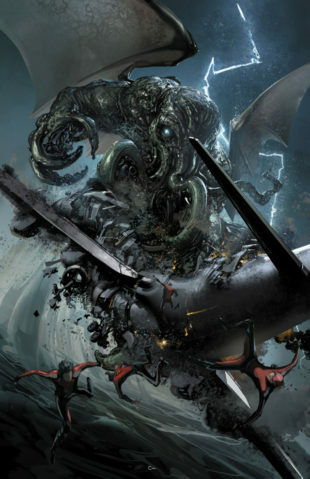 As the brutal commandos of the H.A.R.D. Corps. 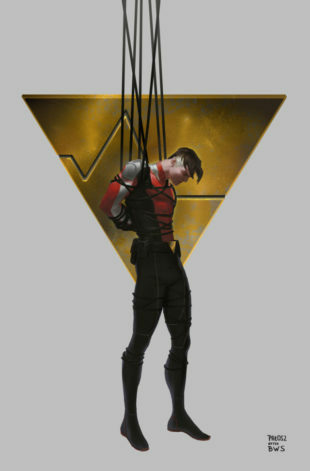 lead an all-out assault on an American metropolis, one of Valiant’s most beloved heroes will pay the ultimate price…and the immediate and lasting ramifications of their death will send shockwaves across the Valiant Universe as THE ROAD TO HARBINGER WARS 2 begins in full force! 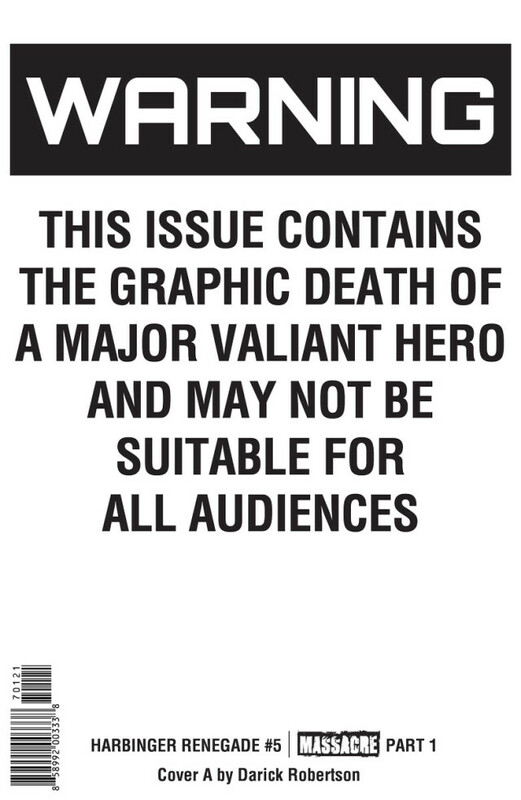 WARNING: Please be advised – due to the shocking on-panel death in HARBINGER RENEGADE #5, Valiant will be taking the unprecedented step of wrapping each issue in a specially manufactured advisory overlay – complete with a clearly marked warning label – that will ship on all copies of the issue at no extra-added cost. 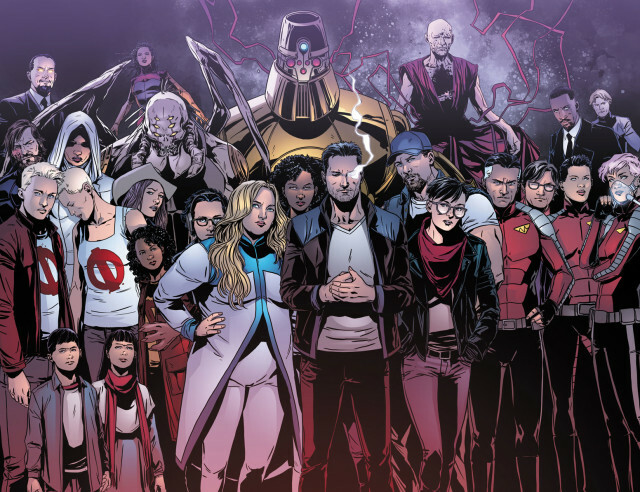 Then, this December, Matt Kindt and Doug Braithwaite march the Valiant Universe to war – and prepare its heroes for the most impactful, world-colliding conflict they’ve ever faced! The crossover event of 2018 begins here in a punishing prelude of power and consequence, only in HARBINGER WARS 2 #0 – featuring an exclusive cover by superstar artist Clayton Crain(4001 A.D., X-O MANOWAR)! 32 pgs| T+ | COMING IN DECEMBER! 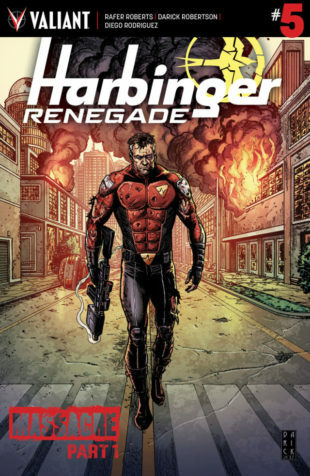 *Available only by redeeming all four mail-away coupons included inside HARBINGER RENEGADE #1-4.